Nathan finishes the Real Insurance Spring Cycle! 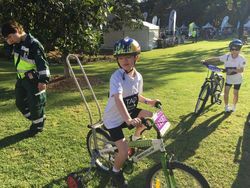 Nathan put in a huge effort and finished the 15km City Ride in the Real Insurance Spring Cycle to help other kids with disabilities to ride a bike for the first time in their lives. Nathan was definitely a TAD Hero today when he rode from North Sydney, over the Harbour Bridge to Pyrmont with his mother, Emily and brother, Jason. Nathan is 12 years old and rides a Freedom Wheels bike to support his balance and gross motor skills which are affected due to Nathan having Down Syndrome. But Nathan dug deep and although the 15km course was a challenge, he was determined to finish. 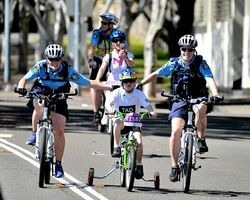 Emily says, "Nathan was getting very tired on the last 4km but we met some Officers from the Police Bike Unit who helped give him a push. It really motivated him to keep trying and he started to pedal harder." 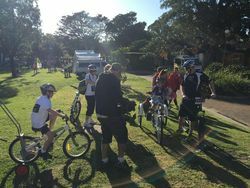 Many other riders called out messages of support to Nathan along the course as they had seen him on the Channel Ten Eyewitness News. "The riders were very supportive of Nathan and said &apos;hey I saw you on the news, nice bike&apos; or &apos;keep going Nathan, you can do it!&apos; which really encouraged him," says Emily. At the finish line Nathan was greeted by a cheer squad of riders and TAD volunteers. 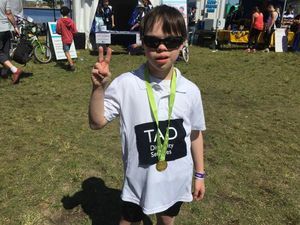 "Every one cheered at the finish line, it was such a great moment for Nathan and really boosted his confidence that he was able to complete his challenge," says Emily. 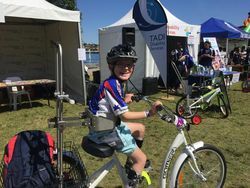 Nathan has raised over $3,000 which will fund three Freedom Wheels bikes for other children with a disability to ride for the first time in their lives. Emily says, "Riding through the tree-lined streets from North Sydney, then to see magnificent views of the Opera House was so special and such a wonderful experience for the family. We will be back next year!" CONGRATULATIONS to Nathan and the Stewart family from everyone here at TAD Disability Services. We are constantly inspired by what our Freedom Wheels riders can achieve and are so grateful to the Stewarts for raising awareness of the Freedom Wheels program. This means other families with children who have a disability can enjoy the benefits of cycling as a family. Another familiar face on the ride was Mitchel Olsen who was showing off his new modified trike! You can support other children with disabilities to enjoy riding a bike and help Nathan reach his target of funding ten Freedom Wheels bikes. Support Nathan here – every little bit counts!